One choice you’ll need to consider is whether to feed your dog or cat a dry or wet (often referred to as canned) food — or maybe both. Both canned and dry pet foods are good choices. They need to meet the same standards for nutrient levels (known as nutrient profiles), so both types will provide adequate nutrition. But for some pets and situations, one form may be more appropriate than the other. 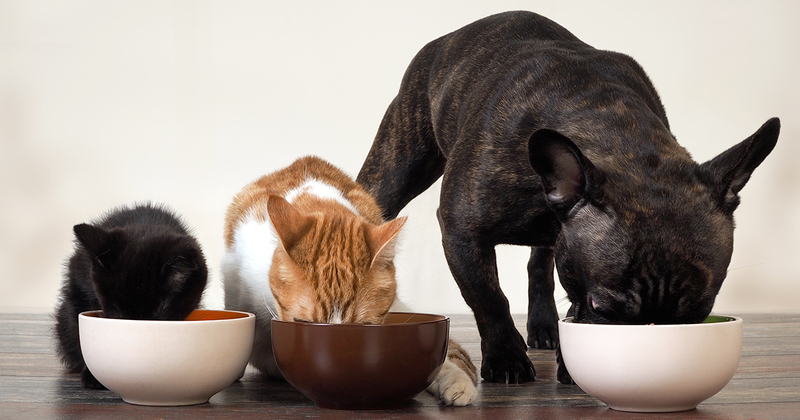 Here are several things to consider when choosing between dry and canned pet foods. DOGS: IS DRY OR CANNED FOOD A BETTER CHOICE? According to many veterinary nutritionists, whether you feed a dry or canned food doesn’t matter for most dogs. Choosing one or the other type is a matter of personal preference — yours and your dog’s. Canned foods may be better for dogs with health issues such as urinary tract conditions or chronic kidney disease where increased water consumption is helpful. Dogs who have trouble chewing due to loss of many teeth, misaligned jaws or a uniquely small mouth can find canned food easier to eat. Canned foods are also a good option for older dogs who have lost some of their sense of smell or who have poor appetites. Many canned foods are higher in protein and fat than most dry foods. If your dog doesn’t tolerate high-fat diets well, you’ll need to either find a low-fat canned food or feed a dry food. In terms of feeding and storage, the most convenient type of dog food is dry kibble. In fact, most dog owners feed predominantly dry food, especially to larger dogs, for logistical and financial reasons. Measured portions of kibble can be left out all day for your dog to free feed without fear of spoiling. Because dry foods contain less water than canned foods (about 10 percent compared with 70 to 85 percent, respectively), dry diets can be less expensive to feed on a per-serving basis. Some dog owners believe dry diets provide oral health benefits. That may or may not be true — it depends on the specific food. Some dry foods have an anti-tartar coating applied to the kibble that may help reduce tartar buildup. Other kibbles are formulated with interlocking fibers or at sizes that promote chewing to reduce plaque and tartar. Unless you’re feeding a dry food specifically made for dental care, you may see few if any oral health benefits from dry food. That’s especially true if your dog tends to gulp down his or her kibble without chewing. You should still brush your dog’s teeth regularly regardless of the food that’s fed. The bottom line: Both dry and canned dog food deliver the nutrients your dog needs. So unless there’s a specific health concern, choose the one that you feel your dog prefers. You can also feed both by feeding canned food for one meal and dry food for the other or by using canned food as a topper! CATS: IS CANNED OR DRY FOOD THE BETTER OPTION? Both canned and dry cat foods are excellent choices as long as the chosen food is 100 percent complete and balanced for your cat’s age and life stage. Some cats (and their owners) tend to prefer one over the other, but the best option may be to feed both to your cat, especially as a kitten. Many cats won’t eat foods as adults that they weren’t offered as kittens. Two common feline health problems — lower urinary tract disease and kidney disease — benefit from increased water intake. Cats that eat only dry food often can’t drink enough to compensate for the water content difference between dry and canned foods. Many veterinarians now recommend offering some canned foods with different textures to kittens to increase the likelihood that they’ll be willing to eat canned diets if it becomes medically necessary. Once your kitten has been introduced to canned food, you can then decide whether you want to feed only canned, a combination of canned and dry, or all dry food. Like canned dog foods, canned cat foods are typically higher in protein and fat and lower in carbohydrates than most dry foods. And because of their water content, canned foods help increase your cat’s total water intake. Canned foods are available in a variety of flavors and textures because “mouth feel” tends to be important to many cats. The convenience of dry cat food makes it popular with cat owners. Compared to canned food, the lower moisture content of dry kibble means you can leave a measured portion out for your cat to graze on. Many cats prefer to eat multiple small meals over the course of 24 hours. Dry food is also easier to use in a puzzle feeder, which provides both mental and physical stimulation. The downside to dry food is that it can be difficult for older cats to chew. The bottom line: Ultimately, your cat will decide whether he or she prefers dry or canned cat food, and even which kibble shapes and canned food textures he or she is willing to eat. In the end, there’s no single right or wrong choice when deciding to feed dry or canned pet food. What matters is that you make the decision based on your pet’s needs, including any medical issues, and your lifestyle and budget. RELATED POST: Canned vs. Dry Food: Is One Better for Your Cat?